As all mobile service providers are now relinquishing their unlimited data plan schemes for all iPhone users, there has been a rising need of a control system that will help people track their data usage and enable them to stay within the maximum allowed limit of their bandwidth plan. The Download Meter for Wi-Fi/ 3G/ EDGE/ GPRS – reduce spending on mobile internet, offered by HedonicSoft seeks to solve this issue by monitoring our daily data appetite. As the name implies, the application is designed to arm people with the ability to keep track of the volume of data sent and/or received over the air. The application works with the assistance of an in-built iPhone statistical tool which reads them on every run and compares it to the previous data. With the help of this reading, the application will then calculate the amount of data that is sent or received over the network and over Wi-Fi individually. All that you have to do is enter the limit of your data plan and the first day of the billing cycle when you run the application for the first time on your iPhone or iPad. With this information, the app will automatically give you signals when you reach significant levels of your data allowance. Moreover, the application will self-activate itself when you reboot your device. 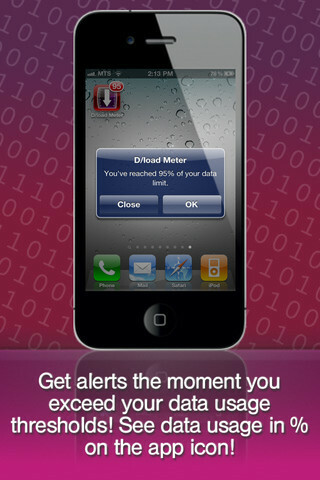 ✓ The application even without having to open and check, will give alerts when nearing the allowed bandwidth coverage. ✓ The Download Meter allows you to create and manage “counters”, which is a feature that aids in tracking traffic beginning from a specific time. ✓ It works in harmony with all carriers in different parts of the world. It does need a login ID or password and there is no need to wait for your carrier’s report to see what is your data usage for a particular month. ✓ “It can support and control four commonly used types of data plans – monthly, 30 days (for AT&T), weekly, and daily. Also it supports bi-monthly and bi-weekly data plans used in some countries. ✓ The Download Meter will display the amount of data used as a percentage at all times. ✓ The application does not make use of the internet to make a report of your data usage. Therefore, you don’t have to spend any money to view your data usage. ✓ Since the iPad, iPhone and iPod support the app, by buying it once, you can run it on all three devices. ✓ When you input your monthly data limit, it automatically calculates and suggests the amount of data that you can use comfortably in a day, so as to help stay within the allowed limit at the end of the month. ✓ The “Since Previous Run Function” helps to determine the exact amount of data used for running a particular application. ✓ It also segregates traffic into incoming, outgoing, Wi-Fi and mobile internet. In spite of all these excellent attributes, the application does fall behind in a few areas. The data usage it displays may not always be true, especially when the iPhone reboots and the application is not running beforehand. However, since it helps people reduce their spending on over usage of data, it is definitely worth the cost!